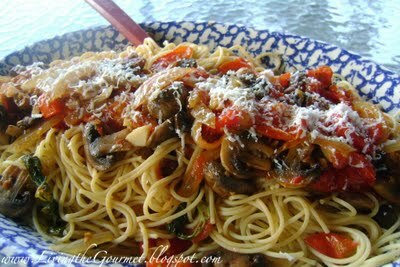 Foodista | Recipes, Cooking Tips, and Food News | Fresh Garden Tomato Sauce with Grilled Button Mushrooms!!! Heat a large frying pan with a drizzle of olive oil. Add the onion and garlic. Sauté until the garlic is slightly golden and the onion is clear. Add the tomatoes and simmer on low to medium. Heat a griddle and place the sliced mushrooms on the griddle to grill. Drizzle with a little olive oil and grill until golden on both sides. Add the mushrooms to the tomatoes. Add the wine and continue to simmer on medium to low. Add the seasonings. Place the basil on the grill and drizzle with a little olive oil. Grill for a minute and add to the sauce. Prepare the spaghetti as directed on box. Place the spaghetti on a serving platter. Drizzle a little olive oil and grate Ricotta Salada cheese on the spaghetti. Top with the tomato sauce and more grated Ricotta Salada cheese. 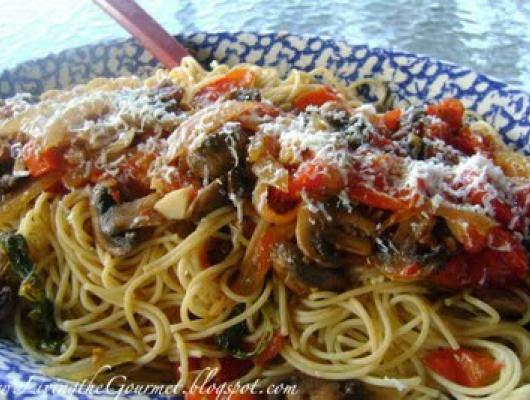 This dish is easy to prepare and the taste is that of a gourmet restaurant! Serve with a colorful side salad and some Italian bread.